When recalling the bizarre weather that descended on Western Mass. in 2011 — tornadoes in June, midsummer flooding, the freak pre-Halloween snowstorm — it’s easy to forget that, even absent all of that, the year would have been a challenging one for home insurers. The reason? A January and February riddled with ice dams and roof collapses, thanks to snow that seemed to fall every other day for weeks on end, gradually building up the weight on houses and damming under the eaves, causing water to pour into homes. “We paid a lot of claims. That was a big deal,” said Kevin Ross, vice president of Ross Insurance in Holyoke. But while the past few weeks have brought a similar onslaught of snowstorms, he doesn’t expect nearly as many claims this year. It’s a learned behavior being observed across the industry. John DiStefano of Preferred Mutual Insurance agreed. “As I drive around, I see homes where people have used roof rakes to get some snow off around the edges, or they have people going up on the roof shoveling for them. That’s always a proactive approach,” said the personal-lines territory manager for Massachusetts and New Hampshire. Therefore, it’s good news for insurance companies — which implemented rate increases of 5% to 15% regionally after the 2011’s series of unfortunate events — that customers are increasingly taking matters into their own hands by keeping their roofs and gutters as clear of snow as possible. But when it comes to winter home hazards, they say, roofs are only part of the picture. 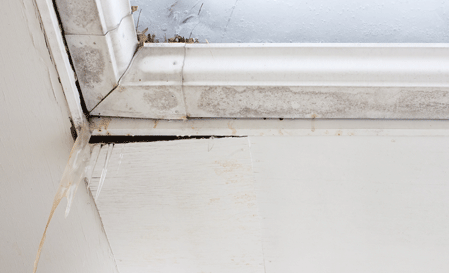 Typically, Ross said, homeowners facing winter roof damage don’t have to scramble to see if they’re covered. Kevin Ross says homeowners have become more proactive about preventing roof damage during the winter, and insurance companies have become better at educating them. As for roof-collapse concerns, that’s a tricky area to navigate, because the weight of the snow isn’t always clear from a visual check, forensic meteorologist Steve Wistar noted at accuweather.com. In the Northeast, he explained, roofs are generally designed to support 30 pounds per square foot, but some are built to support 40, 50, or even 100 pounds per square foot. Further complicating matters, that weight is determined by water content, not merely depth. 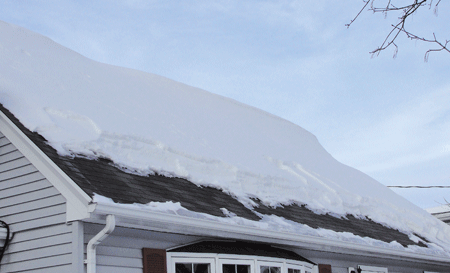 Specifically, dry, powdery snow weighs less than wetter snow, and its flaky texture makes it prone to drifting, which is ideal for roofs designed to handle drifting snow. But, over time, snow compacts and settles down, meaning the snow won’t be as deep, but the weight will be the same, Wistar said. Finally, when temperatures rise and snow becomes rain, the snow already coating rooftops can become saturated with moisture, weighing it down. And even when the snow does begin to melt, it can refreeze around gutters and drains, trapping more melting water on the edges of the roof — which, of course, can cause ice dams. Columbia Gas of Massachusetts recently issued yet another concern for homeowners regarding rooftop snow accumulation — specifically, a number of incidents involving large icicles and snow accumulation falling from rooftops onto natural-gas meters, causing gas-line ruptures and gas leaks. The company noted that it’s important that natural-gas meters and exhaust vents for heating equipment and other appliances are free of snow and ice, as gas equipment requires adequate airflow for safe combustion — and proper venting of appliances — to prevent dangerous carbon-monoxide situations. Recent winters in Massachusetts have seen brisk sales of roof rakes as homeowners try to prevent ice dams from forming. 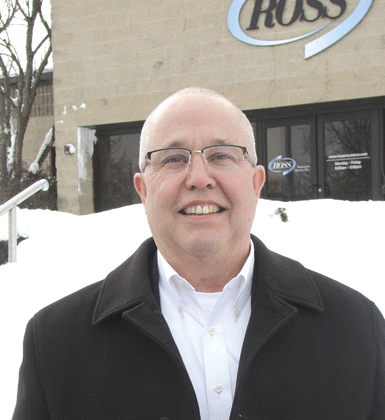 When protecting their homes from cold-related damage, Ross said, customers shouldn’t look outside only. Because home insurance covers personal liability in addition to property damage, he also encourages customers to keep sufficient ice melt handy to prevent slips and falls by the mailman, UPS driver, or neighbors. It’s not like winter necessarily poses more weather-related insurance hazards than the rest of the year; damage from warmer-weather events, like tornadoes and hurricanes, are typically covered, Ross said, although policyholders might want to check on whether they’re in a covered flood zone and, if not, whether they’d like to add that to their plan as well. But cold-weather threats are typically slower-developing, DiStefano said, giving insurance clients a chance to prevent them with tools as simple as roof rakes and sidewalk salt. That pleases Ross, who clearly recalls the surge of claims in early 2011, when roof collapses and ice dams caught too many Western Mass. residents off guard. Three Keys to Beating Procrastination …Today!